A group exhibition Sandro Botticelli, Roy Lichtenstein, Andy Warhol, Gerhard Richter, Joe Goode and Jean-Michel Basquiat. Laughing on the Outside: Selections from the Permanent Collection presents artworks from MOCA’s collection that register the ludicrous, the impossible, and the playful. On view are stairs that lead to nowhere, invitations to exhibitions that contain no objects, and boots that appear to walk by themselves. There are a pair of chimerical blue orbs by Lita Albuquerque, an early study of boxy green forms by seminal Modernist Josef Albers and a series of monochromatic paintings by Félix González-Torres that depict the colors of the Palestinian flag — a sequence of white, green, red and black that was once outlawed by Israel. Artists of Color is The Underground Museum’s third exhibition curated by our co-founder Noah Davis. It presents color-driven work in the form of monochrome, hard-edge and color field painting, sculpture and immersive installations. The show includes works by artists Joe Goode, Josef Albers, Michael Asher, Dan Flavin, Carmen Herrera, Jennie C. Jones, Donald Judd, Ellsworth Kelly, Diana Thater, Felix Gonzalez-Torres, Lita Albuquerque and more. Color is a building block of artistic practice and our own aesthetic experiences. Artists of all mediums use color to express shapes, light, mood and emotion. Think about the specific shades that represent serenity, nobility, energy, or purity. Color is also used by people and political movements to define culture and countries. It can make visible the often unseen connection between our bodies and the cosmos. Our hope is that through this show you develop your own relationship to color. That together we expand the dialogue around color theory. That you take new notice of how colors interact with each other, both on the canvas and in life. Joe Goode, Milk Bottle Painting 229, 2015, acrylic on board with milk bottle, 42 x 42". April 21, 2017 in Goode, News. I WAS ALWAYS AWARE THAT MY WORK WASN’T POP. And Walter Hopps knew it too, even though he included me in the Pasadena Art Museum’s “New Painting of Common Objects” in 1962. I had the attitude of, I don’t care where you show me as long as you show me. It’s not very often I choose to revisit a series I’ve done before. April 14, 2017 in Goode, News. One of Joe Goode’s fond memories of the New York art scene of the '60s was when the great Andy Warhol invited him to dinner at “my favorite restaurant.” Goode, who was then so poor he had hitchhiked to Manhattan, was dazzled. Would it be Grenouille or maybe the Cote Basque, where Truman Capote nestled among his entourage of millionaire fashionistas? 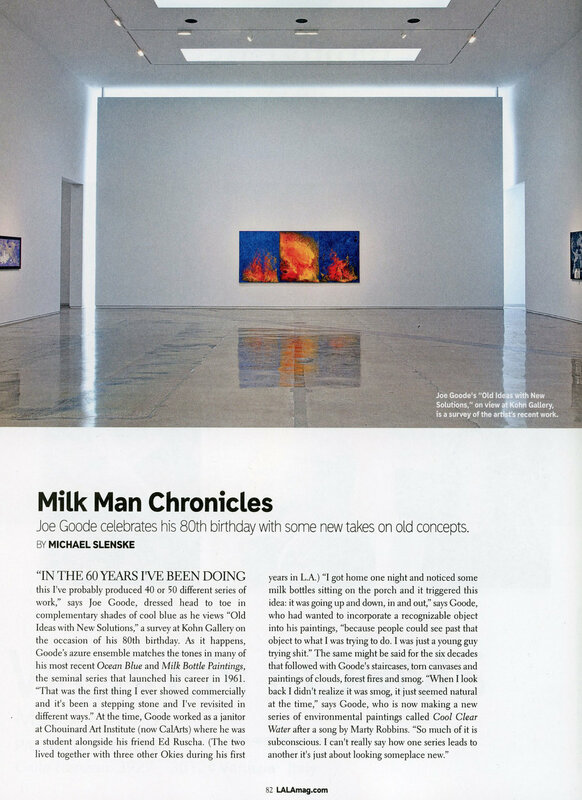 March 23, 2017 in Goode, News..
Coinciding with the artist’s 80th birthday, Los Angeles’s Kohn Gallery will present a survey exhibition of the Los Angeles artist Joe Goode, a veteran of the Californian light and space and conceptual art movements. Joe Goode is 79 and still painting vigorously in his studio near the Santa Monica Airport, but back in the early 1960s, he was sitting in a car in Oklahoma City with an old high school buddy. Artist Jerry McMillan was trying to convince him to join him in California. The Norton Simon Museum presents Duchamp to Pop, an exhibition that examines Marcel Duchamp’s potent influence on Pop Art and its leading artists, among them Andy Warhol, Jim Dine and Ed Ruscha. Los Angeles in the early ’60s was a blank canvas for a new generation of artists. It was a city almost completely devoid of an art scene; unencumbered by the artistic history that haunted Paris and New York. Goode is probably not that well-known to New York’s current art audience, but he was a seminal figure in the development of the Los Angeles art scene in the early 1960s. A colleague of Ed Ruscha, Goode was included in one of the very first exhibitions of Pop Art in America, “New Painting of Common Objects,” curated in 1962 by Walter Hopps at the former Pasadena (now Norton Simon) Museum. Goode’s work evolved over the ensuing years to include expansive painted views of the sky, which he then defaced by tearing away or gouging substantial portions of the image. Much like the slashed canvases of Italian abstractionist Lucio Fontana, Goode’s work focused on the space behind the painted surface. This show presents a small selection of his “Torn Cloud” and “Vandalism” series, dating between 1967 and 1976. August 19, 2014 in Goode, News.. Unlike a lot of transplants to L.A., Joe Goode was not amazed by the horizontal nature of this city where the sky is usually blue and broad. He had come from Oklahoma City, an even flatter expanse of terrain with far worse weather. He came in the ‘50s at the behest of his childhood friend Ed Ruscha and never looked back. Nonetheless, over the years, Goode has repeatedly explored the sky in paintings and drawings. July 25, 2014 in Goode, News. 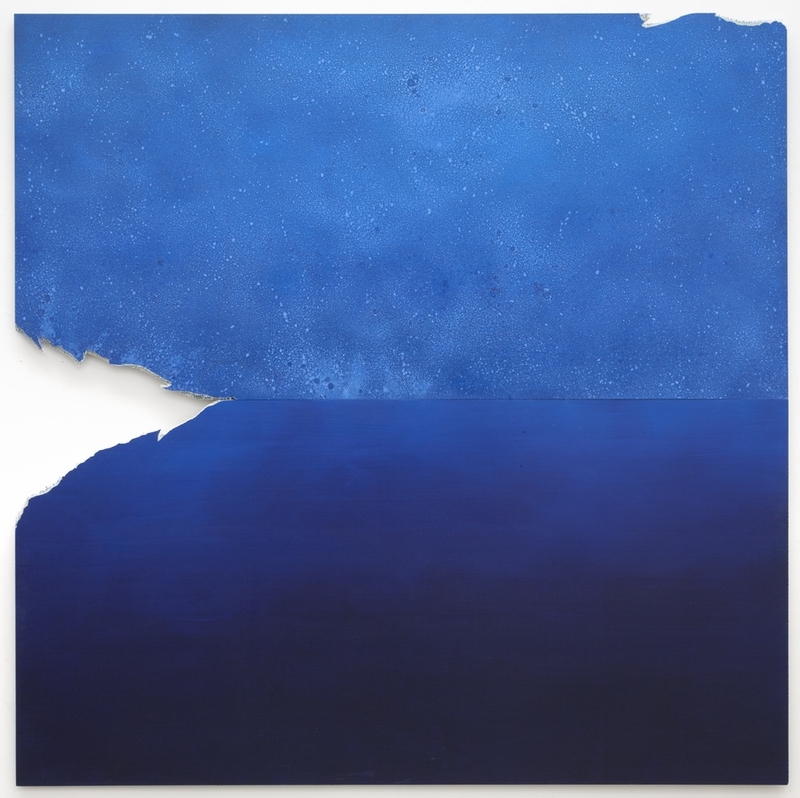 If you know painter Joe Goode, who road-tripped to L.A. from Oklahoma in 1959 to make his go as an artist, you probably know his drawings of torn paper or paintings of blue skies. They’re pretty nonchalant and usually modestly sized, so it’s surprising to see how big and majestic the new paintings in his "Flat Screen Nature" show at Kohn Gallery are. They’re two-tone expanses of color painted on sheets of fiberglass. Even though you could tumble right into those deep blues, Goode’s still not taking himself too seriously. Every piece has weirdly ragged edges and the titles are jokes: Honk if You See Jesus for one with a ghostly shape near the bottom, or Coming Attraction for one that looks like a big-screen sunset.